My friend Al McCarn has hit a home run with this post. Did you ever wonder why the donkey is the only animal mentioned in regard to redemption in Parsha Bo? It always puzzled me and I remember it being a source of discussion over the years. But, I never really “got it” until this year, with Al’s post. Interestingly enough, this is the torah portion being read the week of my birth. Do you think Abba is trying to tell me something??? Donkeys in Transition. Top left: James Cagney as Nick Bottom with Anita Louise as Titania in the 1935 production of A Midsummer Night’s Dream (via “The Many Faces of Nick Bottom” on Shakespeare Talks). Top right: Pinocchio turns into a donkey, from the 1940 Walt Disney film, Pinocchio, via The Disney Wiki. Bottom Left: Donkey (voiced by Eddie Murphy) in Shrek the Third (via HD Wallpapers). 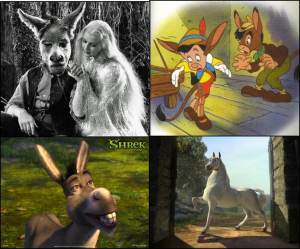 Bottom Right: Donkey as Stallion in Shrek II (via Wiki Shrek). Previous PostOf Pharaohs and Free WillNext PostWhat Does the Bible Say About Keeping the Commandments?